Last week I published this article on the college football conferences and argued that no conference outside of the SEC could make a sound claim as being stronger than the ACC. I was promptly lambasted by Nebraska and UCLA fans for not shedding a favorable enough light on their beloved programs. So, here is a completely, 100%, objective graphic for you to enjoy. 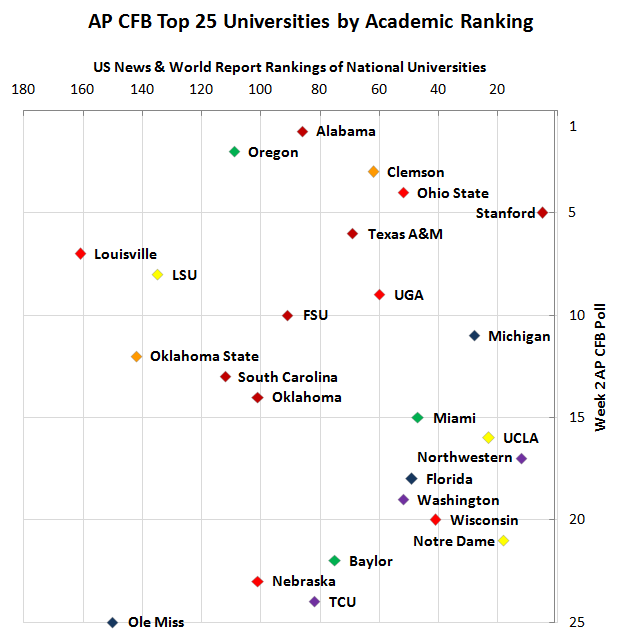 Stanford and Clemson, as with the Wall Street Journal Grid of Shame, are in the upper right hand corner, but you’ll notice that there are no “weaklings” displayed as all schools on the plot have a AP Top 25 football team. Thanks for the comment and nice blog post!